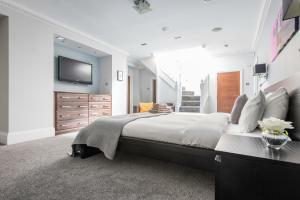 A-HOTEL.com - Luxury and cheap accommodation in London, United Kingdom. Prices and hotel, apartment booking in London and surrounding. This indicative offer was derived from the most recently booked accommodation in London and sort by the price, from cheapest London accommodation to the most expensive hotels. To select accommodation by your preferences we recommend to choose from 6 225 accommodation offers in London in total. By entering the dates of your overnight stay in London and using the filter tools you can sort the best possible accommodation for you. The entered dates of your stay are crucial for the most accurate offer as it derives all the online information on pricing and availability of London accommodation. Then you can book the selected London lodging (hotels, apartments etc.) immediately. Just 100 metres from Marble Arch, the elegant and luxurious Hyatt Churchill is situated in London's West End and a short walk from Hyde Park and Oxford Street. Luxurious, spacious rooms at the Hyatt Churchill offer scenic courtyard views, king-size beds and iPod docking stations. Featuring free WiFi throughout the property, Marlin Waterloo offers accommodation in London. Buckingham Palace is 2 km from the property. Mayfair House offers a mix of classic and contemporary apartments in the heart of London's prestigious Mayfair. Situated just 300 metres from the famous Park Lane, the property offers private parking and free Wi-Fi. Set in London, 1.1 km from Natural History Museum, Courtfield Studios offers free WiFi and garden views. Located within 5 minutes’ walk of London Victoria Rail and Underground Station, this Comfort Inn is just a 15-minute walk from Buckingham Palace and its gardens. Less than 1-mile from the Houses of Parliament and Westminster Abbey, this hotel offers free Wi-Fi and a 24-hour front desk. Located within 1 km of London Zoo and 1.3 km of Regents Park in London, Second Nest Regents Park offers accommodation with a TV. Stanhope Mews Apartment is situated in the Kensington and Chelsea district of London, 600 metres from Natural History Museum and 700 metres from Victoria and Albert Museum. This property offers access to free WiFi. Situated in London within 3.1 km of Tower Bridge, Access Canada Water offers accommodation with free WiFi, a flat-screen TV and a kitchen. Welcoming guests since 1909, the Strand Palace Hotel is located in London’s West End within just 700 metres of the Adelphi and the Vaudeville theatres. The hotel is home to 2 on-site bars offering cocktails and afternoon tea, and a restaurant serving British cuisine. 300 metres from Piccadilly Theatre, Soho Residences by Allo Maisons is set in the Westminster Borough district of London. Featuring city views, this apartment also comes with free WiFi. Set within 700 metres of Savoy Theatre in London, Covent Garden provides accommodation with free WiFi and flat-screen TV. The units have a fully equipped kitchen with dining area, an oven and a microwave. Premier Hotel by Eurotraveller offers modern rooms and a stylish lounge bar. Buses stop close to the hotel, to allow easy access to central London. Craven Hill Luxe offers accommodation in London, 1.6 km from The Serpentine and 1. Set in London within 1.1 km of Dominion Theatre, Primestay Fitzrovia Apartments offers accommodation with seating area and a kitchen. In the heart of London’s Theatreland, The Piccadilly London West End is just 300 metres from Leicester Square. The 5-star hotel has a fitness centre and boutique bedrooms with free WiFi. Lamington Serviced Apartments are set over many beautiful Victorian buildings in the quaint, tree lined Brackenbury Village of Hammersmith and Brook Green. Offering modern interiors, with fully equipped kitchens and spacious living areas. Just 2 minutes’ walk from Kensington High Street, the Holiday Inn London Kensington High St. offers air-conditioned rooms with en suite bathrooms and free access to the gym. Situated up the road from London’s Silicon Roundabout, M by Montcalm offers luxurious accommodation in the heart of Shoreditch. There is an indoor pool, spa, sauna and fitness centre for guests’ use. Nestled between the River Thames and St Katherine’s Dock, and next to Tower Bridge, The Tower Hotel offers ideal location, a restaurant, a bar and a fitness centre. Free Wi-Fi is available throughout.